Aside from the various cartoons available throughout the catalogs, you have options such as getting images re-drawn or re-captioned and having color added. It doesn’t stop there because you can get such services as having custom characters created, illustrations created for a multitude of applications ranging from book illustrations to logos and web banners. I am very flexible and interested in hearing what you need, so don’t hesitate to ask questions. Get customized comic strips for your company web site or perhaps that company Facebook page. The options are limitless. T-shirt designs and cartoon icons can be created to promote your company or business or group. 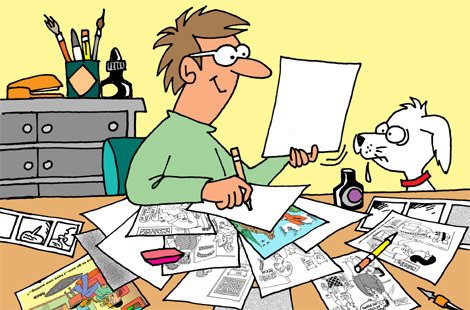 If you have an association needing cartoons to represent you, tell me what you have in mind. Just use my convenient contact form to ask any questions. I am here for you! If your publication seeks editorial cartoons, you can get them customized by supplying your concept which will be created for your approval. A great way to speak directly to your readership! I have illustrated many books from ranging from children’s books to books with comedic content. A detailed list can be provided upon request. Logos are my specialty. I can work with you on creating a character or create an emblem or backdrop to incorporate a cartoon character or text over a chosen background. I don’t limit my cartooning to a finite set of rules. If you need any kind of special image created or a mascot, or comic character illustrated. Tell me what your vision is. No job too big or small! 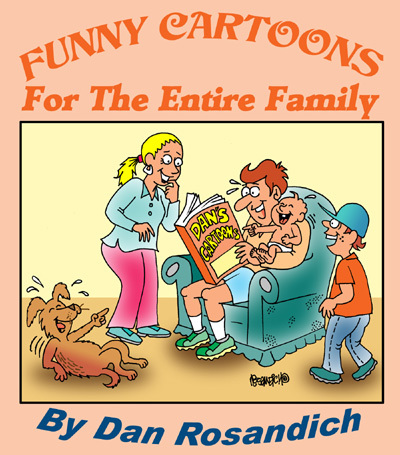 I published Dan’s cartoons when I was editing Mechanix Illustrated magazine back in 1976. His work added a humorous flavor to an otherwise serious publication. We reconnected on LinkedIn and his work is still great after all these years! We have been assigning cartoon work to Dan for over 20 years and he’s created article illustrations, panel cartoons and humorous illustrations for our corporate advertisers. into cartoon magic. He’s talented, thorough, blazing fast and puts his customers first. You can stop searching for a cartoonist now. Images can be reviewed in simple to navigate categories and downloaded via email. After making payment using any credit card in the easy to use shopping cart, you get the cartoon via an email link plus an invoice for your records. Also offering illustration services for books, commercial projects and much more.